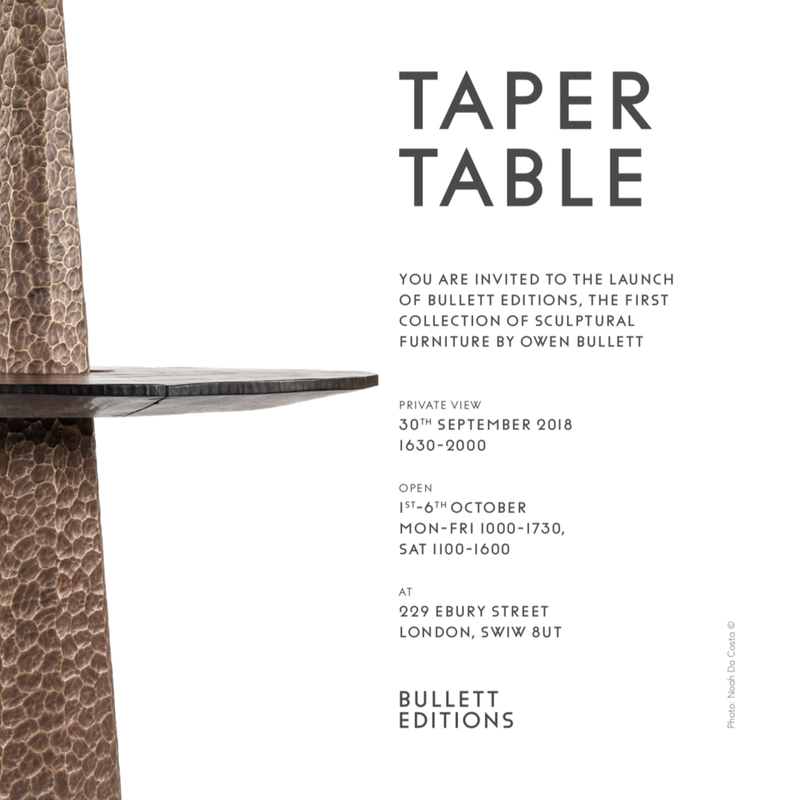 This October sees the launch of Bullett Editions: A collection of Sculptural Furniture. The designs will be revealed at an exclusive pop-up on Ebury Street, London, from 1st to 6th October. Guests are invited to view this stunning collection at the heart of London’s premier design district during this major week in London’s art and design calendar. Primarily working in wood, metal and cast bronze, Bullett has developed his own sculptural language throughout his career, steadily developing his understanding of functional objects along the way. The new range maintains the key sculptural concerns of material, scale and surface, and showcase Bullett’s signature combination of balance, colour and texture. Each of the designs are limited and made directly by Bullett in his London studio. The collection comprises a thoughtful selection of stools, benches, a console table and the eye-catching ‘Taper’ table – created in burnt sycamore and patinated bronze. Since graduating from the Royal College of Art in 2005 Owen has undertaken regular projects making furniture pieces for the likes of Mattia Bonetti, Fredrikson Stallard and Francis Sultana, and his own acclaimed sculptures can be found in both public and private collections in the UK and abroad.